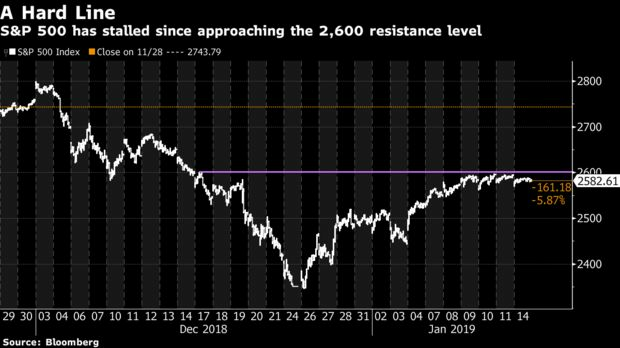 It may be tiresome to read day in and day out, but everything seemed to stall the second the S&P 500 came within a couple of points from touching the ~2,600 resistance line. The brakes aren’t strictly being pumped on the post-Christmas rally — it’s also the volumes: Aside from that Christmas Eve session to remember, the last two days have seen the lowest trading action on the consolidated tape since late November. That’s probably a result of general market fatigue from what has been an unusually eventful couple of months, especially through the holidays. It’s also a function of a ton of Fed speak having been priced into the market over the past few weeks, a prevailing atmosphere of uncertainty in regards to the trade war and trade impact in general, a “What Me Worry?” reaction on Wall Street to the record-setting government shutdown, and this in-between state when macro news is beginning to cede to micro as earnings season gets underway. Banks had a good start with Citi — the BKX rose 1.2% Monday while the broader financials group was the sole S&P 500 sector in the green Monday — but that might not last long as JPMorgan shares are already fading ~2% in the pre-market after a slew of headline misses, from adjusted EPS to FICC sales/trading and investment banking revenue. It’s not like this wasn’t telegraphed by the Street.